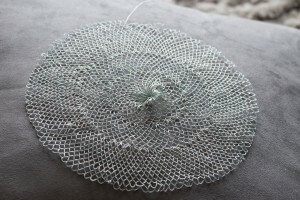 I just wanted to give you a little glimpse on a technique which is fairly new to me and which I am about to try out for the first time, filet knitting or netting. Unfortunately I could not find a lot of information about the technique in its medieval form. I was very impressed by this tutorial here from Via Nostra (Thanks a lot! ), which uses the techniques described by Therese de Dillmont and Katrin Kania. I asked my husband to film me while netting. I did not show increasing stitches but those are basically the same technique, only using one net-hole twice or three times. Here is a great overview over different possibilities for increasing stitches. For my first piece I chose a hairnet which is made in rounds, other extant examples also show rectangle nets pulled together with a string to form the bonnet-shape. This is my progress so far. Not as impressive since I really still need to train, but slowly the stitches are getting smaller and more even. I used woad-coloured silk dyed by Marled Mader. I will update on the finished piece once its future owner gets to wear it which will probably be this August. Please give me advice if you have any or noticed any mistakes, I am still learning! Here and here you can find extant examples of hairnets and other interesting pictures about historic netting and nets. Here you can read about other hairnets from our collection, made by the much more talented Christina.